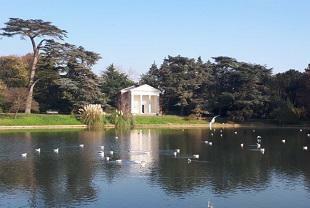 With restoration works now complete, Gunnersbury Park Museum re-opens with a weekend of free activities and entertainment on Saturday 23 and Sunday 24 June. Staff at Gunnersbury hope to welcome the local community to celebrate the transformation of the park and museum. Over the last four years the first stage of the Gunnersbury regeneration project, the Heritage Lottery Fund and Big Lottery funded restoration of the museum and heritage parkland, has been completed. But more is still to come with the next phase – a major sports development project – on the horizon. Extensive improvements have already been completed. Enhancing the natural beauty of the park, restored heritage buildings have been restored including Princess Amelia’s Bath House and the iconic Temple. The once neglected museum has been transformed and boasts new gallery and learning spaces, as well as brand new interpretation telling the stories of Ealing, Hounslow and local people. The years had taken their toll on the house but the grand design by fashionable 19th century architect Sydney Smirke has been restored to its former grandeur, bringing to life the once opulent home of the Rothschild family. Visitors can now appreciate interiors featuring marble columns, the Four Seasons ceiling painting, ornate fireplaces and panoramic views of the 186 acre park. The museum’s diverse collections have undergone extensive conservation work during this period of closure and have now taken pride of place in their new home, ready to inspire visitors of all ages for years to come. The opening weekend will serve as a celebration of Gunnersbury’s past, present and future, as well as a ‘thank you’ to everyone who has made it possible. It will be packed full of activities and entertainment including Knuckle & Joint theatre company’s ‘International Story Quest’ – join Professor Featherstone and Mr Chester (and their giant typewriter) on a mission to write the best story ever written. Visit costumed characters bringing the Historic Kitchens to life and meet Princess Amelia in the Bath House to hear about her 18th century beauty secrets. Enjoy live music from Acton High School’s talented all-girl band as well as a variety of other entertainment throughout the weekend. There will be creative activities for the whole family and the café will be providing their usual range of food and drinks as well as freshly made wood fired pizzas, already proving to be a firm favourite amongst the dog walkers and families delighted to have their local café back. Keep a look out for the Curator who will be running tours of the museum and the Head Gardener whose tours will be highlighting some of the new features of the park.